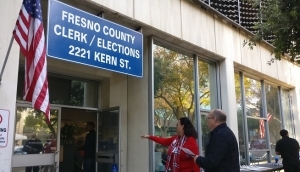 FRESNO (KMJ) — Fresno County Clerk Brandi Orth has announced a multi-city tour to introduce a proposed change to the way citizens vote. A number of new voting methods have been examined, but the favorite is to embrace the changes introduced in by the Voter’s Choice Act. “In the Voter’s Choice Act, we have voting assistance centers throughout the county and everyone gets mailed a ballot. You don’t have to ask for it as you do now,” explained Orth. The County Clerk’s Office revealed that five other counties have already adopted the new method. Orth said sending a mail-in ballot by default provides more flexibility to the voter.